The Devoted subclass is currently giving -10 to accuracy instead of the bonus accuracy when choosing a two-handed weapon as the chosen weapon. Ranged weapons were not tested. Edited by kilay, 16 June 2018 - 02:02 PM. I understand that there is no bonus to accuracy. However, it is treating your weapon in the accuracy stat as -10 accuracy. Instead of the neutral. It is giving you the penalty. I'll post a screenshot tomorrow. have you watched my video and have you read what i wrote? 2- when i switched to a Great Sword the - 10 voted isn't anymore greyed out and there isn't wrote (Conditional) and that means that the penalty is applied .The same about penetration bonus that is applied only if i wield an estoc . Edited by kilay, 17 June 2018 - 10:44 PM. Yeah, it's working properly for me as well (Greatsword Devoted character). I hadn't even noticed the -10 Devoted conditional bit until I checked just now, you only even see that if you hover and hold shift to show more. Otherwise it'll only show the currently applied and relevant ones. So if there is a bug with it, it's at least not an overly general one. 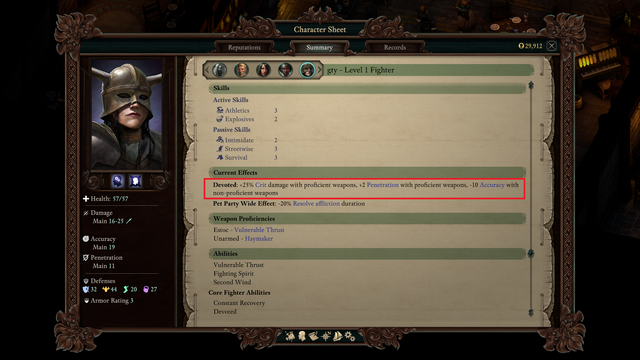 In the character sheet summary, is the Weapon Proficiency for your chosen weapon showing up properly? Which weapon did you choose? I can whip up a quick Devoted character in my game to see if it's specific to that weapon type (assuming it's not Great Sword or Estoc). Thanks for the assistance all! Let us know if you have any further questions.